You can't blame owners of the HTC ThunderBolt for feeling left out. The first LTE enabled handset offered by Verizon, the phone was originally supposed to be updated from Android 2.3 Gingerbread to Android 4.0 Ice Cream Sandwich by the end of last August. But that deadline came and went without the update coming and HTC ThunderBolt owners started to think that they would be stuck forever at Android 2.3. But in December, HTC said that owners of the handset should remain patient, and that the update would be arriving soon. 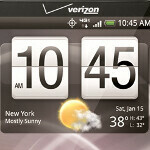 Now, Verizon has put up a support page for the Android 4.0 update for the HTC ThunderBolt. The site reveals some of the new features such as Face Unlock, Lock Screen Notifications (which allows you to access your notifications even when the phone is locked) and a Usage Center where you can monitor data usage and set alerts. The Recent Apps feature allows you to tap on a thumbnail to multitask with a recently used app. Also included with the update is Verizon Remote Diagnostics which lets a technician look at the inside of your phone from a remote location. And the update also eliminates the bugs that made the device unstable and caused numerous re-boots. Lastly, Verizon Apps, Blockbuster, Rhapsody, Verizon Video and Mobile IM have all been removed from the device. Those with the HTC ThunderBolt will feel like they have a new phone once the new OS build is installed. The only problem is that there is still no date for the update which once again is said to be "coming soon". I do! Although I have cyanogenmod 7 on it. "No one uses the phone anymore..." I'm sure that there is people who still use HTC ThunderBolt and they will be happy to get update. Of course it is shamefully late for such update, but better later than never! if I update to JB, those this mean I lose unlimited tethering? Possibly the worst part about Big Red... "Oh, you want your OS updated? Well alright then! Here's our newest phones..."
Or, alternatively, "Oh, you want your OS updated? Here's XDA. (Or rootzwiki, etc...) " I've had ICS on my TBolt for months. Who made the rom? I looked a while ago but was never able to find any for the tb. i got the thunderbolt on the first day it became available through wirefly. that contract just came up for upgrade in october, but i wanted to wait until spring to see which devices i could move to, so i'd imagine there are a lot of thunderbolt users out there whose contracts haven't expired yet and many of them haven't yet reached upgrade status. that said, i don't want the update. i learned the hard way about updating phones with obsolete specs to modern a OS. when apple tricked me into updating my iphone 3g to iOS 4, the thing would hardly run at all because it didn't have the power to run the new OS. it made my final months with the phone awful (and ruined my appetite for apple products). the thunderbolt's been great and i'd hate to have that problem again, so close to the end. I really do feel sorry for anyone who still owns this device. I am happy to have moved onto the galaxy note 2; a real device. Like I said in a prior comment, the remaining 15 people in the world that still use the Tunderbrick (who haven't rooted) will be ecstatic to finally get ICS. Unfortunately, I just had mine replaced with the Rezound this week. The phone would no longer connect to 3G/4G, then the replacement Brick they sent wouldn't send/receive MMS. I really liked the phone, hopefully the Rezound will be a good replacement. In any case, I'm due for an upgrade...just waiting to pick up the Note2 for $200-$250. why not just sell your Rezound for $150-200 or trade it in to Verizon for a $100 & get the Note 2 now?